It’s about time Alfa Romeo built a new halo supercar. As much as we love Alfa Romeo’s current line-up, the brand is currently lacking a halo supercar. That wasn’t the case way back in 2007 when the automaker launched the alluring 8C Competizione, however, arguably . Quite simply, it’s an automotive work of art with a design that still looks stunning today, featuring lightweight carbon fiber components, a Maserati-derived platform and powertrain, and a Ferrari-derived 4.7-liter V8 delivering 450-hp. Only 500 examples of the coupe were produced along with 500 spider variants between 2007 and 2010, but it helped generate vital publicity for the Italian automaker. Today, however, Alfa Romeo is conforming to industry trends by building high-performance sedans and crossovers like the Giulia Quadrifoglio and Stelvio Quadrifoglio. Both are excellent cars in their own right: we’re besotted with the Giulia Quadrifoglio, and the Stelvio Quadrifoglio holds the current lap record for the fastest SUV at the Nurburgring. Right now, it’s probably hard for Alfa Romeo to justify building a new supercar, especially when the automaker’s sales are still struggling to gain traction in the US. If Alfa Romeo does ever decide to launch a successor to the beloved 8C, has imagined what it could potentially look like. The 8C was a rare breed of supercar that was stylish yet subtle, and the design of its fictional successor adopts a similar philosophy. “The design language and the character of the vehicle has been reduced to the minimum in order to make it timeless and elegant,” Presciutti wrote. Less is more, in other words. 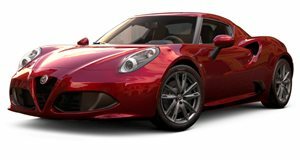 At the front is a pair of slender headlights, and a complete lack of traditional air intakes, instead making sole use of a small lower grille and a tweaked version of Alfa’s triangular nose. At the rear, Presciutti has designed a pair of bulging wheel arches, a large lip spoiler and a pair of semi-circular taillights positioned above a set of centrally-mounted tailpipes. Its futuristic design may lead you to think it has a fully electric powertrain, but Presciutti has designed this potential 8C successor with a hybrid setup “because a sportscar is made out of sounds, vibration, smell, mechanical functions - if you remove it, the pleasure and the joy might be gone.” We’re not holding our breath for a new Alfa Romeo supercar any time soon, but at least renders like these allow us to fantasize.